It was February 2016, and I was about to embark on a trip to Central America with a group from my church. While I’d never been to Guatemala before, this feeling of anticipation was nothing new to me. Twenty-five years earlier, a much younger version of myself was leaving on a similar journey. I’d been ready then, too, to push myself to my physical and mental limits and make connections with people who lived in a world different from my own. This guy, Davide, was one of my favorite people I met. He was an artisan at ADISA. He taught me so much! Still, I had no way of knowing how life changing this upcoming trip would be for me. In the same way a Friendship Visit in Nebraska had impacted me in 1994, one particular stop on our mission trip in 2016 was especially meaningful. In Santiago Atitlán, we visited a small school and workshop known as ADISA. In the workshop, I met artisans like Diego, Davide, Francisca and Juan. Even though I was thousands of miles away, I had not felt more like I was back out on the road on Journey of Hope than I did during my time with ADISA. Though separated by many miles, the needs were much the same. Upon learning more about the financial needs of my new friends in Guatemala, I felt The Ability Experience could make an immediate impact. 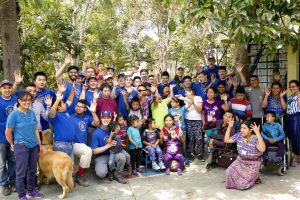 In March of last year, twenty Pi Kappa Phi men took a trip to Central America for the inaugural Ability Camp Guatemala. Over the course of a week, these men built a dental clinic which will provide free dental care to the region. Now in 2019, The Ability Experience has two crews returning to ADISA to share in this life-changing service opportunity! Wow. While cycling from California to DC was one of my proudest accomplishments physically, I consider my experiences getting to know people with disabilities to be much more important personally. I know you understand the feeling, whether you were dancing with a joy-filled woman with cerebral palsy, building a ramp for a person who otherwise couldn’t have entered a building or helping give a puppet show teaching compassion for people with disabilities. Experiences like these stick with you for the rest of your life. These lessons changed me as a person. This is why I consider Journey of Hope pivotal in my life. It allowed me the opportunity to turn my attention from myself, to serving others. For me, The Ability Experience has come full circle. Won’t you join me in becoming a member of the 77 Society? Sign up for a monthly gift today and show the world that you, too, have learned the importance of looking beyond yourself and to the needs of others. Doing the good work requires support, OUR support as Pi Alphas. 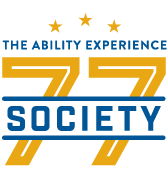 I don’t think I could ever repay the organization for what I learned in the summer of 1994, but my monthly donation as a 77 Society member is the least I can do to help push the mission forward. 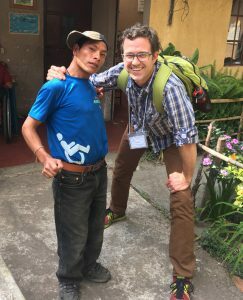 An automatic monthly draft of whatever amount you can give is an effortless way to ensure The Ability Experience has the support of the Pi Alpha community – the support to fund even more shared experiences, like Ability Camp Guatemala, that deeply impact people with disabilities. Please sign up.